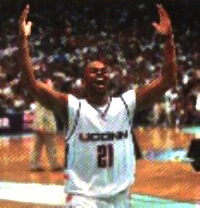 Ricky Moore was a Guard for the UConn Huskies from 1995 – 1999. He’s a member of the UConn Basketball All Century Team, and was co-captain of UConn’s first ever National Collegiate Athletic Association Championship Team in 1999, playing a key role in the Final Four games against Ohio State and Duke. I had the pleasure of talking to Ricky in September 2004 about his basketball experiences, memories, and his current career path. Ricky became interested in both football and basketball around age ten or eleven, and was very good at both sports. His first love in sports was football because it was more popular in the south, and he had been around his brother who played a lot of football, and went to college on a football scholarship. During his freshman year of high school the basketball team record was 4 wins and 22 losses. Ricky decided he should focus on one sport, and become really good. “I felt all along that basketball would be more successful for me,” so he chose basketball, and began working out, and practicing drills every morning at 5:00 AM at the YMCA with a couple other guys before going to school, and after school he practiced with the team. The hard work paid off, the team record was 26 wins and 3 losses during his sophomore year. “I realized that when I put the work in to it that I could become a really good basketball player so I continued the same schedule of workout all through my high school career.” His junior year the team record was 27 wins and 3 losses, and Ricky’s senior year the team won the State Championship, had a record of 33 wins and 1 loss, and were ranked 9th in the country. Ricky was ranked around 40th in the country of top recruits during his senior year of high school. He was among a stacked class with players like Stephon Marbury, Kevin Garnett, and Ron Mercer. When he arrived at UConn, they were also stacked with players like Ray Allen, Doron Sheffer, and Travis Knight. Ricky worked hard, and continually got better throughout his career. Since graduating from UConn in four years with a Bachelors Degree in Social and Political History, Ricky’s been focusing on his basketball career. His first year out of college he tried out for the Detroit Pistons, but they had Jerry Stackhouse, and Grant Hill on the team, and Ricky didn’t make the team. He then played in the Central Basketball Association (a semi pro league) for the Connecticut Pride. Ricky has also tried out for the Charlotte Hornets, and spent some time playing in Europe, Germany, Turkey, and Austria over the last few years. He’s had some great experiences on each team, met a lot of new people, and learned new cultures. He particularly enjoyed Germany, and the German League. On each team he’s enjoyed success. While spending a lot of time playing basketball out of the country, playing in Germany his team finished with the best record they ever had in the conference. In Austria the team had just moved from the second division up to first division, and it made it to the semi finals. Ricky isn’t able to watch a lot of UConn games, but he was able to watch the Final Four this year. He believes that if Emeka Okafor wasn’t in foul trouble during the game against Duke, UConn would have beat Duke by a lot of points, and the championship game against Georgia Teach wasn’t really much of a game. “I knew nobody really had a chance, I didn’t feel anybody had the strength or talent to compete with UConn.” He thinks this year they are going to be pretty good too. They may not be first or second in the Big East, but they’ll be somewhere close to the top, and they’ll make the NCAA Tournament, and give it a good run.